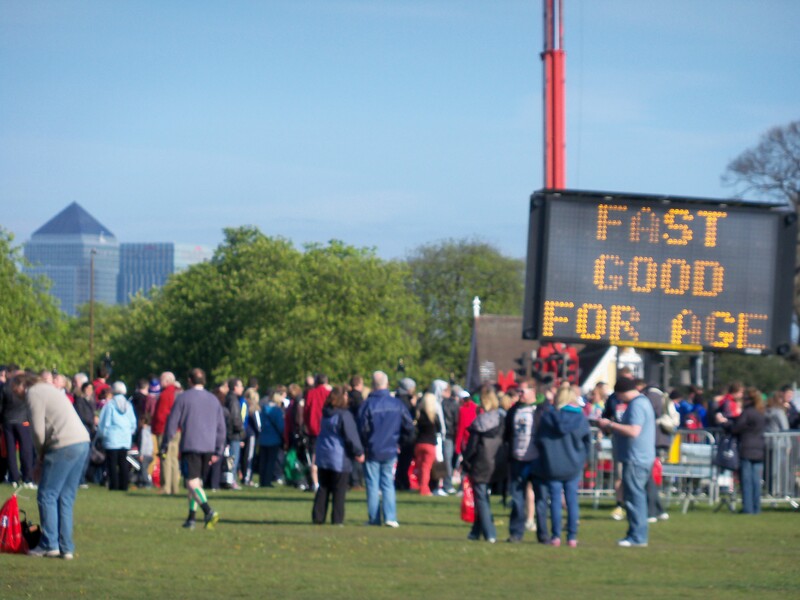 On the way to the red start at the Virgin London Marathon, with Canary Wharf (aka Mile 18) in the background. Despite an initially poor weather forecast and days of torrential rain and rumbling thunder, I woke up to find that the weather was gloriously sunny, but with a brisk breeze. In an echo of last year’s race, I was struck by how warm the sunlight was on my way to the tube. Last year, of course, had been way too hot for my liking. I’d been coming down with a cold. Things hadn’t gone so well and I’d missed my target, knocking my racing confidence much more than I’d really wanted to admit. There was a further echo as, sitting in the overground train listening to the same playlist as last year, the train had stopped for an age outside Blackheath station. But this year felt different. Training had, for the most part, gone well. I was feeling quietly confident, and I also knew that it was important to stick to my hydration and fuel strategy (last year I’d decided to make do with energy drinks and ignore my carb gels). My plan was to take the pace easy until halfway, and to take a gel every 7 miles. Nothing radical, just sensible running. So, once into the starting pen, I kept reminding myself not to go off too fast. Which was perhaps less of a concern than I feared it would be as the first mile was fairly congested. However, we started with a tail wind, on a predominantly downhill section, and by the time the red route joins the blue and green routes, I had started to build up a margin of safety. After about six miles or so I started to feel a bit of a twinge in my hip. This was the same discomfort that had hit me during training and I was determined that it wasn’t going to affect my race – especially because I was otherwise feeling so good. I focused on feeling good and running strong, adjusted my gait and got on with the race. Running the race again, I had memories of different elements of the course. 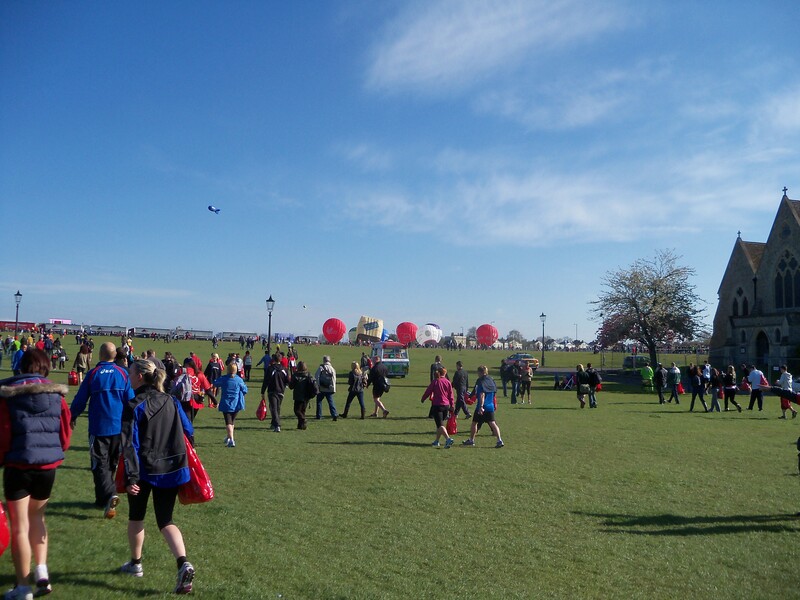 These largely revolved around other runners (a Spartan, a guy in an inflatable duck suit) or the crowd (two randoms running alongside the flow of runners until they got out of breath). But all the way round people in the crowds were holding out their hands for high fives, which – perhaps randomly – added to the atmosphere of the day and kept spirits high. I had four gels with me for the race, each different flavours. At the seven mile mark I took on the banana and orange gel, which was probably my least favourite flavour. The miles passed smoothly. Having set myself the target of passing the half-way mark between 1:28 and 1:30, I was pleased to pass the marker at 1:27 and didn’t feel concerned that I’d run too fast. At mile 14 I knocked back the next gel – fruits of the forest – took on some water and pushed on. Originally I’d envisaged myself speeding up once through the half-way point, but I kept to a steady pace to avoid a painful last few miles. Getting into the docklands, I recognised more of the route than last year from weekend long runs and making my way to Home Run. The section of the course around Canary Wharf weaves around, and I knew that mum, my step dad and my girlfriend would be trying to spot me somewhere around this point. Unlike last year, I spotted them and waved happily (winding up as an arm at the edges of various photos) before getting back to the task at hand. I was 18 miles in and feeling strong. At 21 miles I took the next gel – black cherry yoghurt – and some water. A little later, I picked up a bottle of Lucozade just to make sure I was fully tanked up. At that point it hit me: I had less than 10k left to run. My pace had felt steady, but I’d more or less completely lost track of my mile splits. My Garmin had become increasingly out of synch with the official mile markers – as had many other runners’, resulting in a few mid-race jokes. 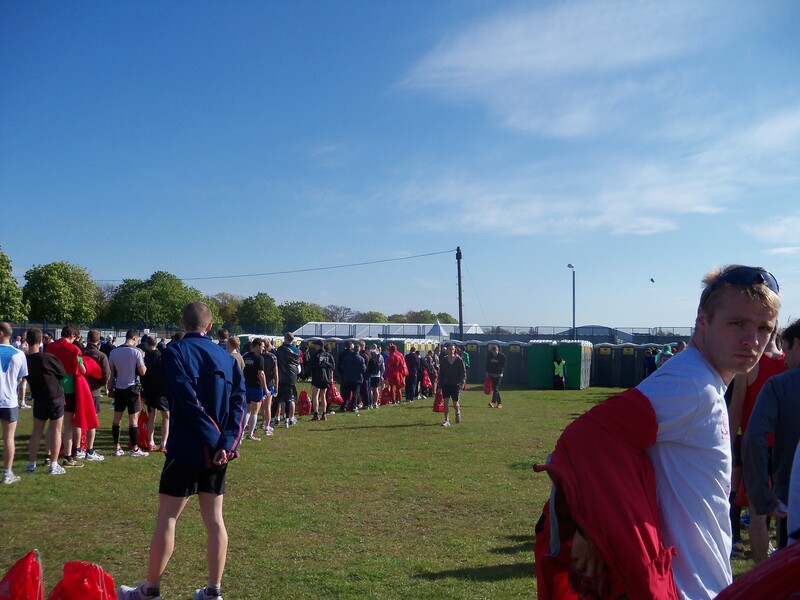 Nothing says 'major marathon' quite like long queues for a portaloo. If you look closely, there's a guy in red dressed as the devil. I say 'dressed', but really I mean in red body paint and a pair of pants. Tower Bridge passed to my left, and we started our descent through to Embankment. At 23 miles, with little more than 5k left to run, I shouted at myself something incoherent about eating 5ks for breakfast and pushed on. Around this stage, I started passing a lot of people. Some walkers, some runners slowing in the final stretch of the marathon. My quads were on fire, but that seemed to be the only physical problem I was having. Embankment passed, and the much-anticipated headwind along the river never really amounted to anything. I occasionally had to slow if I got trapped behind people I was going to overtake, but I wove wide and pushed on round. As the ‘800m to go’ sign appeared on Birdcage Walk I upped the pace, managing to work up to a fairly satisfying speed (not a sprint, mind) for the final stretch before crossing the finish line. The previous year I’d finished, feeling destroyed and on the cusp of vomiting the moment I passed the finish line. This year, I slowed, took a breather, and made my way to fetch my medal, pick up my bag and go meet my folks. Sure, my legs got stiff pretty quickly, and there’s every chance I’ll lose a toenail, but I’m relatively unscathed. Oh, and in case you were wondering, I ran the race in 2:55:31 and came 800th overall. That’s a PB of nearly 4 minutes, and certainly something to celebrate. Garmin splits are here (I took a few seconds to actually get round to stopping my watch at the end) and official VLM splits and timings are here. Cheers! Now comes the hard bit – reminding my legs that they like to move… Stairs are a bit challenging at the moment! Oh yes, I was there last week! Sideways one step at a time for 2 days. Not sure I was warned about that bit of it. Many congrats, Lewis!!! 800th has a certain ring to it, and 2hr55 is just brilliant. Well done. Thanks Dom! Surely it was just a training run for the mighty Town & Gown 10k though?! Thanks Jacob. I’m very pleased with that result – just need to work out what I’m planning to do with my B race! Fantastic race Lewis! You should be immensely proud of the effort and dedication you have put in. What will Edinburgh bring? !